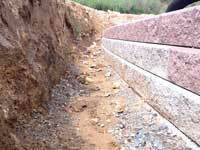 Proper design of retaining walls in water applications requires consideration of some unique design details. Wall rock that can freely drain water is required for the infill soil mass. The wall rock and proper drain pipe location helps prevent the buildup of hydrostatic pressure forces during rapid draw down events. Another item to consider is the erosion of the base of the wall due to wave action or currents. Rip rap helps protect the base of the wall from eroding. Wave action and currents can be very powerful. Be sure to consult with a local engineer when considering a wall in a water environment. When you know the geometry of your wall, do you know how much block needs to be below ground? It is important to have a good understanding of segmental retaining wall (SRW) embedment for various wall applications to assure good wall design and to get accurate estimates. In order to know how much you must embed your wall you need to consider the overall site conditions. What kinds of slopes do you have on your project? What phase of the project is the wall going to be built in? What are the site soil conditions? Will there be water present at the base of the wall? These factors can influence how deep the wall must be embedded in order to provide a stable base. Segmental retaining wall block is buried to provide additional stability and to minimize the potential of undermining the wall. The general guideline is a minimum of 6 in. (150 mm) of buried block with 1 in. (25 mm) embedment per 1 ft. (0.3 m) of wall height for walls over 6 ft. (1.8 m), up to a maximum of 24 in. (0.6 m). 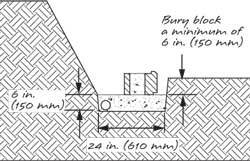 This guideline would be for sites with a flat grade at the base of the wall and no other complicating factors; however site conditions can require additional block to be buried. When designing a wall with a slope below, the engineer must always consider the stability of the slope. Even a relatively short slope can be a problem if the wall is not founded deep enough into the slope. The reduction in stability is directly related to the reduction of shear resistance along the failure surface and the weight of soil stabilizing the structure. Retaining walls are often one of the first structures installed at a site. It is a fairly common scenario to have a paved surface installed near the toe of the wall after the wall is in place. With typical embedment depths, it is likely that future excavation to prepare grade for the pavement may undermine the wall. Embedment should be a minimum of one course below the extent of any future excavation. The potential for scour or erosion due to water currents or wave action may require additional buried block. A qualified engineer should evaluate and provide a recommendation for scour depth so the bottom of the wall can be extended 2 ft (0.6 m) below this depth. In addition to burial considerations, scour protection should be installed at the base of the wall. This may include rip rap, Scour stop™ transition mats or articulated concrete mats. Where bearing pressure capacity is weak, additional burial will add stability to the wall to limit eccentricity with settlement. Deeper embedment will provide additional stability and lateral support to prevent the wall from rotating forward if settlement occurs. There is a limit to this benefit and a local engineer should be consulted if bearing capacity due to soil is a concern. Segmental retaining walls are designed to be flexible systems and as a result they handle soil shrinkage and swelling without damage to the block. Wall embedment generally does not need to extend below the seasonal frost depth or other seasonal volume changes. SRW’s supported on a granular leveling pad can accommodate movement caused by freeze/thaw cycles. To avoid increasing the design height of the wall, the thickness of the leveling pad can extend to a depth beyond seasonal frost. However, if frost susceptible soils are present and local codes require it, you can locate the base of the wall below the depth of frost penetration. Foundation soils susceptible to shrinking/swelling during seasonal moisture fluctuations can be addressed in a similar fashion. Prepping the base properly is important for the long term performance of your wall. To build a quality wall you want to use a clean granular material such as wall rock to create a firm foundation for your project. Excavate the area by removing all surface vegetation and organic materials from the area. These cannot be used as backfill material. 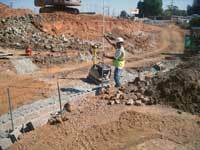 If reinforcement is needed, excavate behind the wall to accommodate the design length of the geogrid. Refer to your approved plans for exact length. Starting at the lowest point, dig a base trench 24 in. (600 mm) wide the length of the wall. Base material shall be a 4 in. (100 mm) minimum depth for walls under 4 ft (1.2 m) and a 6 in. (150 mm) minimum depth for walls over 4 ft (1.2 m). The depth of the base trench will be the minimum depth plus an additional 1 in. (25 mm) for each 1 ft (300 mm) of wall height for the amount or buried block that is needed. Compact the base trench making a minimum of two passes with a walk behind plate compactor. Foundation soils at the bottom of the base trench must be firm and solid. If the soils are made up of heavy clay or wet soils, or the areas have been previously excavated, remove this material and replace with a granular material, compacting in 8 in. (200mm) lifts or less.